BWR Grade plywood is made from 100% Hardwood Timber. German Glue Line Technology is adopted in the process to make it 100% borer proof. Rubber wood, Ply wood, MDF Panel, Teak. MDF – Mat & Glossy laminated, PU (polyurethane coated), Lacquering Aluminum,MDF Lacquered Glass inlay & Laminated Inlay (Glossy or Mat). Hardware’s, Appliances & Accessories based on Customer Requirements. Lustrous And Striking, Handle less Lacquered MDF Shutters For Floor Modules With Push To Open Acrylic Shutters For Wall Modules. Rugged & Robust, these Post-Formed laminated kitchens are strikingly beautiful & exceptionally durable. This is available in a variety of shades and finishes. An attractive combination of traditional profiles rendered In 5 piece framed hard wood shutter. Lacquered/PU coated hardwood frames with laminated MDF inlay which is available in a range of striking shades. High Glossy Laminated MDF kitchen with Aluminum edge banding. A sleek combination of solid wood frames with metallic PU coated MDF inlay panels. Functional and aesthetic, this design is meant to fit the smallest of places and budgets.. 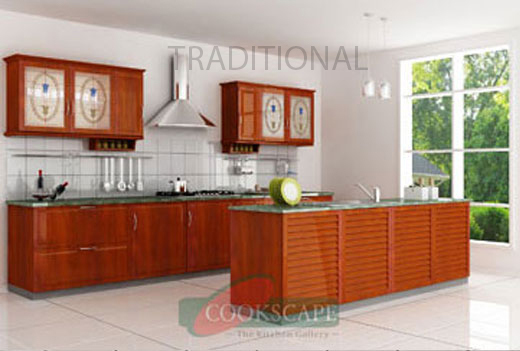 Exuding a warm and inviting air, this kitchen crafted from hardwood, sports a distinctively ethnic look. Minimalist design with lacquered MDF panels which is available in a range of smart shades. Thanks to the continued patronage of our esteemed customers like you and we strive continuously for innovation. Cookscape worked with us for our home interiors right from the planning stage to execution. The Site was done in a highly satisfied manner. Our kitchen layout posed a bit of a challenge as it is a semi - circular shape however there was no hesitation from the team to put in the extra effort .thanks to Cookscape !. Our association with Cookscape is more than a decade now .we are happy with the product quality and their strong technical and management team ,Cookscape provided us customised soloutions for all our home needs. Thanks to the execution team we wish Cookscape all the best . Honestly I was only looking for quality. And I was quite surprised when Cookscape delivered such a high standard in aesthetics as well. © 2018 cookscape.com. All Rights Reserved.